Now that the dust has settled from the excitement that is the Crop Over festival, there are still so many things that you can do, see and enjoy during your summer vacation here in Barbados. 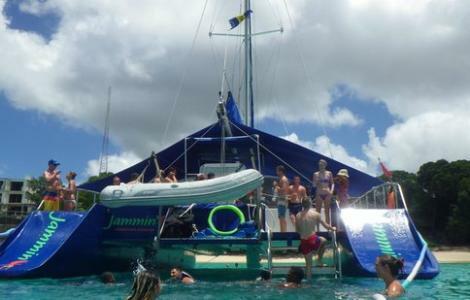 Catamaran cruises are great fun for the whole family! Your ticket cost includes unlimited food and drink, so you can sit back, relax and enjoy the cool breeze. Most cruises begin in Bridgetown and continue along the West or South Coast, stopping for snorkeling and swimming at various shipwrecks and turtle feeding grounds. You can opt for a daytime cruise, which includes lunch, or an evening cruise where you can sip a cocktail as the sun dips below the horizon. If you’re lucky, you may even spot stingrays or very rarely migratory whales! Enjoy the various historical, architectural and geographical sites that Barbados has to offer! You can rent a car yourself or go on a scheduled tour with one of the many providers in the island. Barbados has the highest density of roads per square mile in the world, and you’re still guaranteed to get lost! With so many little lanes and cart roads, your best bet is to stop and ask a local, who will be more than happy to point you in the right direction, or even invite you into their home or rum shop for a Banks beer and a game of dominoes. These unique caves are one of the island's most famous and popular attractions. The caves are naturally formed by water erosion through the limestone rock. The calcium-rich water that runs through the caves have formed the unusual stalactites and stalagmites formations. Travel through the caves is by tram, at certain points during the tour you are permitted to get up close to the formations. This tour is great for children. The endless summer in this island makes Barbados an ideal location for golf and the perfect vacation spot for golfers of any level of expertise! Our first recommendation is Royal Westmoreland which boasts a par 72, 7045-yard championship course designed by Robert Trent Jones Jnr. The golf course is as enjoyable as it is demanding. You’ll find a mixture of short holes, with a challenging back nine preceded by tricky greens on the front. Set in a lush tropical landscape and calling for every club in your bag, it’s consistently rated as one of the top courses in the Caribbean. The Apes Hill Golf Course course offers challenging and spectacular golf was recently rated one of the best in the world. The most advanced golfers will enjoy 7,150 yards from the Professional Tees, while the Front Tees, set at just over 5,000 yards, take full advantage of the fairways’ contours. Each hole is unique, from the 12th hole with views of the east coast to the par-three 16th, whose setting within a coral-stone quarry has earned it the status of a signature hole. The Historic Bridgetown (the Capital City of Barbados) and its Garrison’ was declared a World Heritage Site in 2011. This area is an outstanding example of British colonial architecture consisting of a well-preserved old town built in the 17th, 18th and 19th centuries, which testifies to the spread of Great Britain's Atlantic colonial empire. The property also includes a nearby military garrison which consists of numerous historic buildings. You can book any of these excursions, or discuss any ideas that you may have with our concierge team at Barbados Sotheby’s International Realty.